WASHINGTON, D.C. – Kareem Jackson has been named Week 8 NFLPA Community MVP after raising more than $207,000 for breast cancer awareness and hosting his first annual Pretty in Pink event for breast cancer survivors. 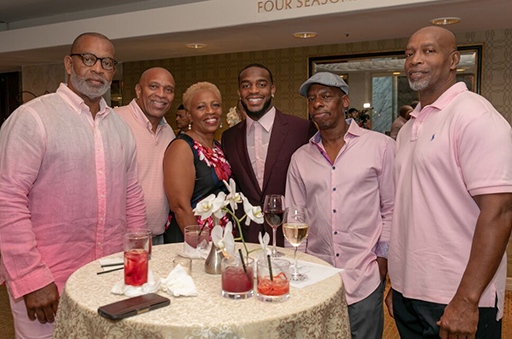 The defensive back’s fundraising efforts took place at his second annual Dinner for a Difference celebrity waiter night in Houston. Several of his Houston Texans teammates, including Week 0 NFLPA Community MVP Tyrann Mathieu, joined the well-attended event, where Jackson made a personal $15,000 donation for the cause. All proceeds will go toward the Kareem Jackson Foundation and its outreach programs, one of which recently took place – Pretty in Pink. As part of October’s Breast Cancer Awareness Month, Jackson invited 75 breast cancer survivors and their guests to enjoy a VIP experience that included a gourmet meal, mobile spa, makeup swag bags and prothesis bra fittings. The Oct. 8 function furthered his foundation’s mission of providing assistance to women with breast cancer and children battling pediatric cancer. In winning this week’s Community MVP, Jackson capped a strong first year for his foundation. Before training camp, he visited Texas Children’s Hospital in Houston for his first Christmas in July to pass out footballs, video games and other gifts to kids receiving treatment. In May, Jackson held his first Tee-Up with Texans fundraising event, which generated more than $75,000 to help women and children battle cancer. In honor of Jackson being named this week’s Community MVP, the NFLPA will make a $10,000 contribution to his foundation or charity of choice along with an in-kind donation to him on behalf of our supporting partner Delta Private Jets. A limited-edition bobblehead will also be made of Jackson and sold by our supporting partner Forever Collectibles at www.sportsfanisland.comand www.foco.com. The NFLPA will donate part of the proceeds from this collector’s item to their charity or foundation of choice. Jackson, along with the other 2018 Community MVPs, will become eligible for this year’s Alan Page Community Award, which is the highest honor that the NFLPA can bestow upon a player.